Many Windows Insiders reported the recent slew of updates released last week, caused their computers to use more memory than before. As a result, Windows’ interface sometimes hangs and pauses. One user explains that before he installed the updates, he had 4 GB of free memory out of a total of 8 GB. After installing the updates, meaning the latest Insider build and cumulative updates KB3197954 and KB3199986, there is only 1.5 GB of free memory left. Despite using various workarounds, such as clean booting, creating a new account, running chkdsk, SFC, and dism, and uninstalling KB3197954 and going back to 14393.321, he couldn’t fix the bug. After additional detective work, the user who reported the problem managed to identify the culprit: Diskeeper 16 Pro. This tool’s role is to boost Windows laptops and workstations’ performance. However, judging by these recent user reports, Diskeeper 16 Pro is actually consuming all the available memory, causing UI pauses and OS delays. I went in to Disk Keeper and turned of the auto defrag and other features (intelliwrite, smart caching, etc.) and then told it to start a manual operation on both my drives and then I stopped it, so that no defrag process was in progress. in less than a minute, my available memory went from 1.6 to 5.1 Gb. I re enabled the disk keeper features and my available memory was gradually consumed again. What is surprising about this forum thread is that 1K Insiders viewed it. Most likely, not all of them use Diskeeper 16 Pro. This means that they’re also experiencing missing memory issues, probably caused by a different factor. 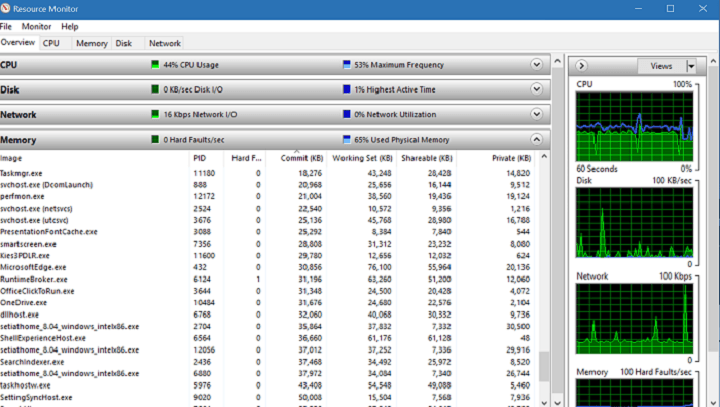 Firstly, Diskeeper 16 DOES use a significant amount of memory on most computers. This is mainly used for the RAM caching feature, which is very beneficial to system performance. The product will typically use up to half of what Windows reports as “Available Physical Memory” for this cache. Here is the important point though; the cache is dynamically sized. If the memory usage by other processes increases, Diskeeper will shrink its cache and hand pages of memory back to Nonpaged Pool so as not to compete for memory with ANY other process that is running on the computer. Moreover, it will always leave 1.5GB free memory, even if Diskeeper’s cache size has had to shrink to zero. Have you also experienced memory bugs after installing the latest Windows 10 updates? Tell us more about your experience in the comment section below.